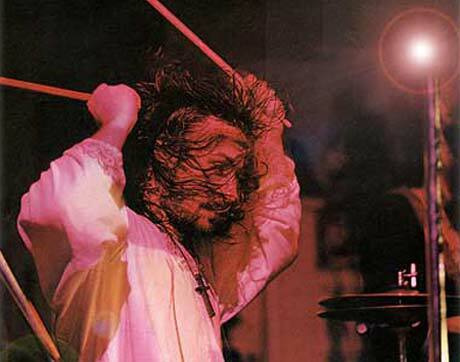 Now that Black Sabbath are back in the public light, under the current Ronnie James Dio-led incarnation Heaven & Hell, the age-old question of why original drummer Bill Ward isn't in the band is bound to come up on a regular basis. Well, the question again arose last Friday (August 7) on Eddie Trunk's Friday Night Rocks radio show on New York's Q104.3 FM, and some new light was shed on Ward's absence from the project. When queried by Trunk about why he pulled out of the original Heaven & Hell reunion, the recording sessions for 2006's Black Sabbath: The Dio Years collection that included three newly recorded tracks, Ward finally went public with the reasons for his decision, citing musical differences with Sabbath guitarist Tony Iommi and an overall dissatisfaction with any version of Sabbath that didn't include original vocalist Ozzy Osbourne. Let me see if I can say this as comfortably as I can, because there's some sensitive stuff about this, and I haven't spoken at public level about any of this stuff... There was a musical difference. For quite a long time now, the only band that I've ever felt comfortable in is the original band. And I've tried to do Sabbath with Ronnie, Sabbath with Ian [Gillan] and Sabbath with other singers as well. And as much as I either like, or don't like, these guys or whatever, it never feels the same to me. And I've never been able to make that move when it comes to being with Tony and Geezer with another singer. However, I thought that because, originally, we were talking about Ronnie - when we were first trying to put some of this together - and I thought, "Well, I'm gonna have an open mind to this." But, at the time, it felt like I was kind of backpedalling a little bit, but I thought that I would be able to actually hang with it and do it and what have you. So I went in there as much as I could with an open mind. A couple of things happened, which I'm gonna have to keep private, which, actually, I felt very angry about. Originally, there was some stuff on the business end, which really, really, really cut me up. And there's still some unresolved things on the personal end as well, which I'm hoping to have clarified and resolved one day - one day it'll clear up. But the main reason inside everything was that Tony, on one of the songs, it was a pretty fast song, was pushing his guitar - it was just like a down beat - and in all the years that I've played with him, since I was, like, 16 - me and him have played together a long, long time - I've never cut across him. In other words, I never go through him - I don't travel through him, I travel around him, and I either build or I pull away, or I make holes, or I do whatever I can do to make sure that I am interacting with the bass and the guitar in the way that I do it. It was requested of me to play a straight beat through, and playing a straight beat through was absolutely against everything I know about drumming, and it was an intolerable request. End of story. I can't do that, and I'm not gonna do that to Tony. He's a man that I love - I'll love him for the rest of my life; we've done so much together. But I could not adhere to the track in which it was being requested of me. I need to go with him. So if he's punching, I punch with him; it's just a natural way that I play. I never go through him like he [doesn't] exist. To me, what was being asked of me was disrespectful to Tony as a player. So I didn't do it. I won't compromise my sensibility... and my sensitivity, either, in music. So I just couldn't cut it. Despite his past grievances with the band, Ward did say he was happy for Heaven & Hell, and he's pleased that they are putting out music and employing the services of another great hard rock drummer, Vinny Appice, who was part of Black Sabbath (when they could actually call themselves Black Sabbath without worrying about a lawsuit from Ozzy) for the Mob Rules and Dehumanizer albums, as well as Heaven & Hell's 2009 opus, The Devil You Know. "I'm out of that situation, [but] I support [Heaven & Hell] completely," Ward added. "I've already seen them play live. I thought that Geezer was absolutely amazing - he blew me away; I was like, 'My God, that's my mate up there playing.' I've known Vin [Heaven & Hell drummer Vinny Appice], basically, since he was kid. I know all of the guys, so where I'm at with it, I completely support them, and I hope they make as much great music together as they want to and I hope that it's a complete success for them in any way that they feel that success is, since we all go about in different ways in deciding what is success and what isn't success. So I'm 100 percent behind the guys." Ward also did not rule out the option of playing with an Ozzy-led version of Sabbath in the future, although with the way Ozzy's health is these days, and with the ongoing legal battles between the Ozzman and Iommi, we doubt very much we'll ever see the original Sabbath back together again. "If everything gets in order and everybody is on the same page, or even half a page, I'm ready to do multiple tours, or multiple albums, with the original band," Ward said. "I always have been; I've never moved from that stance in the last 30-odd years. So I'm down [with] that."